Reconnect with some friends. Treat yourself to a weekend of peace and quiet with nature walks and wildlife watching. Indulge yourself with a massage and a sauna. Take a Yoga Class. Recharge your mind. Learn how to cook something new. Juniper Hills Farm is surrounded by Juniper Ashe and Oak covered hills, interrupted only by rock outcroppings, crisscrossing creeks and big sky. The Farm has become a place of sanctuary, serenity and sanity for all who come here. This area of the Hill Country is ripe with opportunities for the food lover. The high concentration of food and agriculture related businesses make this an ideal destination for the food connoisseur. Juniper Hills Farm is located in the beautiful rolling hills just Southwest of Austin and just North of San Antonio, Texas. This area, known as the “Hill Country”, is surrounded by Juniper Ashe and Oak covered hills, interrupted only by rock outcroppings, crisscrossing creeks and big sky. The Farm has become a place of sanctuary, serenity and sanity for all who come here. We want you to feel the tranquility that this place evokes. Well- appointed, comfortable Cabins are available for weekend getaways. Custom designed retreats can be booked so that groups can enjoy cooking classes or just relaxing and exploring the Hill Country. Reconnect with some friends. Treat yourself to a weekend of peace and quiet with nature walks and wildlife watching. Indulge yourself with a massage and a sauna. Take a Yoga Class. Recharge your mind. Learn how to cook something new. Juniper Hills Farm is the home of Travis “Sibby” Barrett. 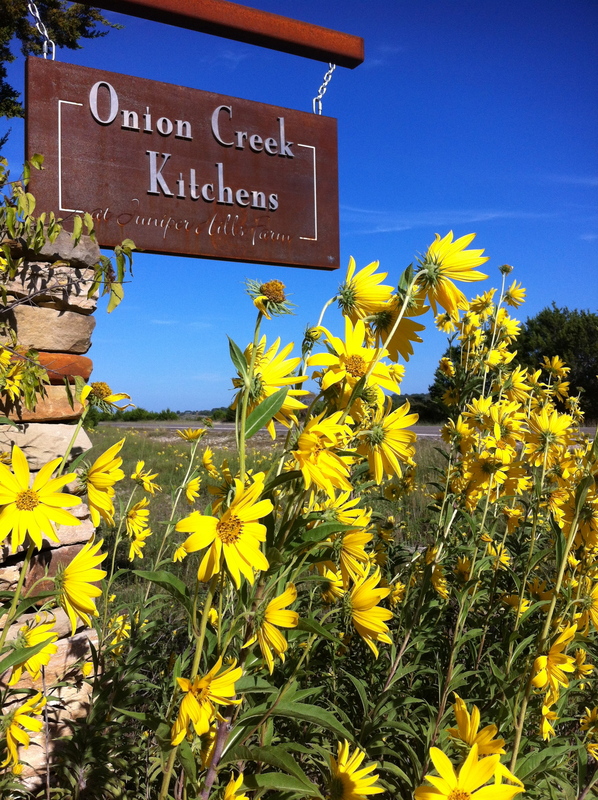 Join Sibby as she welcomes you to Juniper Hills Farm and Onion Creek Kitchens. Sibby is a born and raised true Texan, spending most of her years in Dallas and some of her childhood growing up in San Miguel de Allende, Mexico. Her interest in food and cooking sprung from some of these early childhood experiences in Mexico. The mercados, the street vendors, the colors, the smells, all left a strong impression. She also credits her father for a lot of her cooking style today. He exposed her to a variety of ethnic cuisines and shared his love of bold and spicy foods early on. After studying Journalism in college, Sibby managed a successful floral company in Dallas from 1975-1986. Sunshine Floral Company specialized in high volume cut flower sales, weddings and special events. After developing a reputation for quality and creativity in the floral industry, Sibby began Dallas Affaires. Started as a one-stop party planning company, Dallas Affaires offered catering, cakes, flowers and event planning. After a few years of rapid and strong growth in the bakery arm of the business, she changed their name to Dallas Affaires Cake Company and focused their energies on baked specialties. In 1993 Sibby opened Café Georgia, next door to the bakery. What began as a neighborhood coffee bar quickly evolved into breakfast, lunch and dinner six days a week. Café Georgia became a popular dining spot in the quaint Lakewood section of Dallas. The bakery’s popularity grew and additional space was needed to expand. After two very busy and hectic years Sibby decided to close the restaurant and expand the bakery. The bakery has become famous in its thirty years for its ingenuity and captivating designs. Cakes for high profile clients from the Mayor to Oprah to local sports heros and musicians, have kept this bakery at the top of everyone’s list as “The” place to get their custom cakes made. Sibby has an incredible staff of bakers, designers and consultants that produce approximately 400 wedding cakes and 8,000 specialty cakes each year. Sibby now brings her culinary passions to the Texas Hill Country. In 2001, shortly after her ranch home, Juniper Hills Farm, was completed, Sibby began facilitating Yoga retreats and cooking weekends. 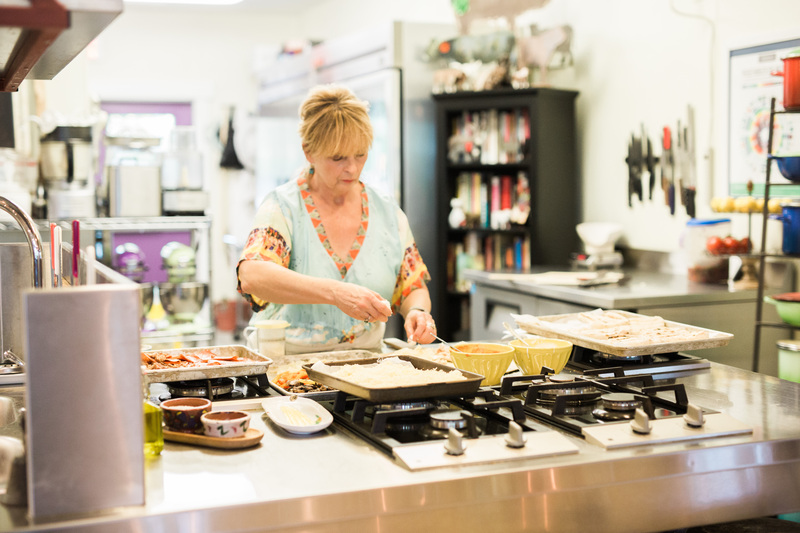 In her own “Onion Creek Kitchens”, she now offers a full curriculum of cooking classes. 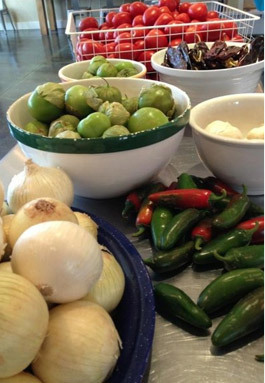 She has also developed a line of spice mixes and a specialty of the house condiment, "Salsa Verde Italiano". This area of the Hill Country is ripe with opportunities for the food lover. The high concentration of food and agriculture related businesses make this an ideal destination for the food connoisseur. Goat cheese farms, flower farms, olive groves, wineries, peach orchards, herb and lettuce farms are all close in proximity. For Classes and Dining Events, Sibby makes a great effort to utilize and highlight these growers in her menus. 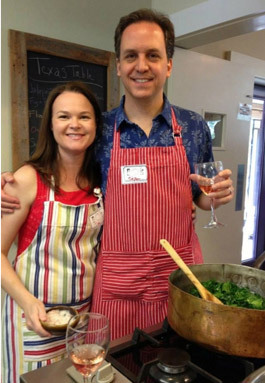 For special, private tours, students can accompany her from farm to orchard to vineyard to gather what they will prepare for the evening meal in her renowned "Hill Country Excursions and Random Acts of Cooking" events. Nearby Blanco, Texas, is now fondly referred to as the “The Lavender Capitol of Texas”, boasting several lavender farms surrounding the heart of Blanco. Also nearby, Dripping Springs has been named "The Wedding Capitol of Texas", with numerous high quality wedding venues.